Here’s another show that falls into that category of slightly unknown gems that go somewhat unnoticed. Famous from a statistical standpoint – it has one of the longest Eyes Of The World on record, clocking in at 23 minutes – the show lives a bit in the shadow of some other stellar performances from the days before and after. Captured here in a very nice above average AUD that only needs a bit of time to warm up sound-wise, the show is strong from start to finish, as most are from this portion of 1979. Treated to a show opening China>Rider, the stage is set for a special night of music. While it seems patently obvious, the sound of the band from this period is a fabulous example of the transition from the late 70’s into the early 80’s, and this AUD captures it perfectly. This applies to not only the manner in which the band was playing, but also the actual sonic output of their sound system. There’s no end of good songs to discuss here, but I want to concentrate on what causes this tape to remain in my mind as one of the very first I grab whenever I’m thinking about 1979: the epic sized portion of the Eyes>Estimated>Frankin’s in set two. This jam ends up forever in my mind not because of tremendous peaks and valleys filled with hairpin turns, but more for its ability to strike a chord that resonates so deeply into the pure pleasure of Grateful Dead music. As I’ve said before, there is often more power in the way this band would sometimes do nothing more than settle comfortably into one of its elemental grooves than the times when they crafted and pushed the music into mind numbing acrobatics. Here, we land in the elemental groove zone and it goes on for the better part of a solid hour. Eyes flips on like a switch, and Jerry’s opening solo quite literally goes on forever. He stretches out into the unending reaches of comfort provided by Eyes, and allows himself to wander the foothills of his own magic valley, never worrying for the sun to rise or fall, beautifully lost in the pleasure of a fully open-ended moment. He often returns to the core rhythm of the song where he seems bound to step to the mic and sing, yet turns away only to go more deeply into hidden grottos that sing to him with the secrets of the earth itself. A verse comes and goes, and Jerry again trails out into the boundless garden, down a seemingly infinite number of wandering paths. We are joyfully lost with him, swept along in his wake of delicate exploration. The verses continue to come and go, framed by Jerry’s continually long solos, each one toying back to a verse only to fly out again for more circuits around the hillsides. By the time we get into Estimated Prophet, the band is navigating deeply into a psychedelic ocean of music. The song throbs and shimmers with spectacular motion, like a fountain tossing sound into the air which then coils and floats like smoke around you. Beautifully, Franklin’s Tower peaks its head around the corner before fully bounding into view. The energy picks up and the joyous march is back in full swing as Jerry’s guitar peppers the air with its lyrical dance. After the last chorus is sung, the horizontal axis of the Philly Spectrum begins to tip at odd angles, slowly back and forth like the deck of some enormous ship at sea. Bobby alters his chording while layering on a phase shifting effect, and his sound sprouts multi-hued flames and feathers. Phil’s bass lines begin to growl like a storm approaching, and Jerry casts his lines into the swirling wind. Bringing the entire crowd into this ever-tilting landscape, the band pushes through a barrier with some heavy block chords that leave the music completely unraveled. Deep groans and swells open before you as the flat ground beneath your feet spreads into endlessly deep canyons. Footing is no longer necessary as gravity disappears and burns the remnants of musical structure away completely. A feverish space jam ensues, overwrought with Caution-like leanings as the drummers pound along like a speeding train. Eventually this dissolves into Drums, closing out an amazing three song jam that tops 55 minutes. I just revisited this one on the drive to work this morning and was once again carried away to someplace very very special indeed. Your description of the Eyes as music that "never stop[s] opening up" is absolutely perfect. The segue into Estimated is beautiful, too! It's hard to describe the satisfaction of being washed over by 23 minutes of Eyes and THEN having an elegantly constructed, beautiful transition into Estimated (well, Bobby's timing is a little off, but not so's you'd notice much). Maybe Jer was making up for 11/4/77! This is a beautiful show, and your write-up hits the nail right on the head as usual. This was my first show. I was 11 yrs old. Thank you Mom and Dad !!! I enjoyed this show, but not YET a personal favorite. Thought I'd share some dislikes, "not-so-sure-about-yets," and some likes. These are just opinions, no disrespect meant. Dislikes: Only one dislike really. For my personal tastes Jerry's voice is a little too far back in the mix. This is easily overlooked, just something I noticed compared to other arena recordings. Holes in the knees of my blues, Odds against me been increasin'/But I'll pull through," for example. Great stuff from Barlow. What is wierd for me is that sometimes I like the songs enough to search out a show for them, then again sometimes I want to skip them. Last is the Cowboy tunes. Again, sometimes yes, sometimes no--for me, mostly no. LIKES (and plenty of them): CCS>Rider is very nice. I love the blend of Bobby and Jerry's guitars in these two songs. I really enjoy Bobby's phrasing of his quintessential glue-lick in China Cat. I can tell that Bobby is muting his strings in this lick--very nice. I also love the transition into Rider because it does not feel forced. It simply flows effortlessly from one song to another. Good to hear Stagger Lee. I can always dig Peggy-O and The Music Never Stopped! Eyes>Estimated>Franklins! Much has been said already, I'll just say Eyes is always heavenly for me and 23minutes is lovely. Great Estimated and it is interesting to hear Franklin's Tower coming from some other place than Help>Slipknot. The band may have done this frequently, but definitely my first exposure to FT in this context. This three tune mini-set truly flows easily. I would definitely give this show an 4-5 star grade on a scale of 1-5. Thx Noah. This was my one and only Dead show, and I had a great time! 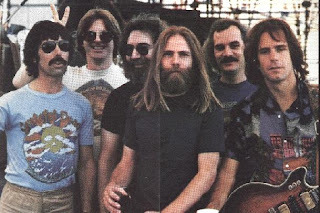 God bless the Grateful Dead!